The webinar consists of two parts. Part 1 EDUCATION: using resources from the AAP Julius Richmond Tobacco Center, reviewing the composition, marketing, regulation and health effects relative to e-cigarettes and, understanding the preventative strategies and techniques to use with patients and families within the office setting. 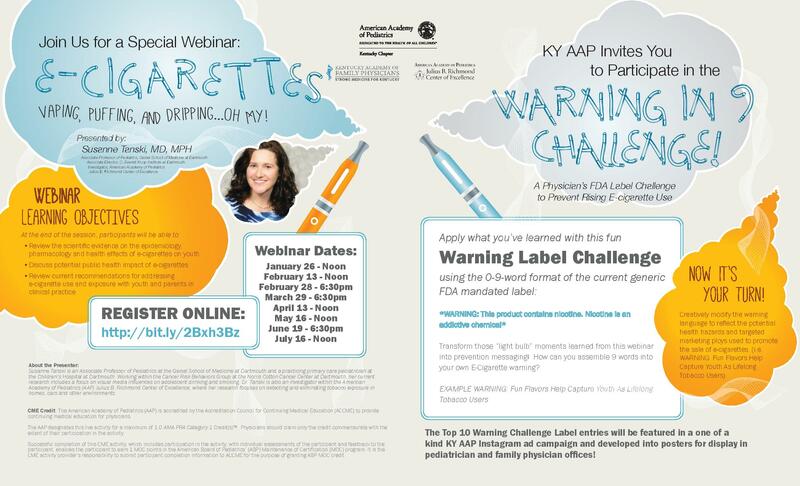 Part 2: ADVOCACY: applying the knowledge of E-cigarettes, embrace a fun FDA Warning Label Challenge. Using the 9-word format of the current generic FDA mandated label (I.e. This product contains nicotine. Nicotine is an addictive chemical), creatively modify the warning language to reflect the real dangers of e-cigarette use (i.e.WARNING: Fun Flavors Help Capture Youth As Lifelong Tobacco Users). The Top 10 Warning Challenge Label entries will be featured in future marketing campaigns, including social media penetration and office posters targeting youth in the Commonwealth. Come join us for this amazing opportunity to enhance your expertise!